condominium complexes in the county. "I have witnessed three murders since I lived here," one resident said. Orange County is offering residents one month free at a hotel and another free month at their new home, where ever that might be. Since the complex was condemned a few weeks ago, people have stayed in poor conditions. City officials said the stairwells are unsafe, walkways have been eroding away and the crime in the area is at all-time high. Many said they couldn't afford to leave, but with the county's help they might be able to get out of the troubled complex. "I am praying it is. We have all been waiting for something to happen," a resident said. Moving the residents will cost Orange County taxpayers. County officials don't yet have the final costs, but Channel 9's Shannon Butler checked and learned that The Econo Lodge where the county is putting residents up charges about $70 a night. That would mean about $2,100 to put a family up for 30 days. 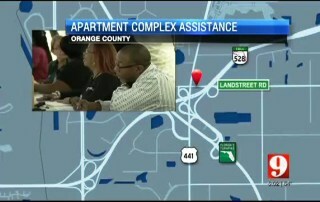 So far, 74 families have come forward asking to be housed by the county. That could cost the family more than $155,000. "People need to know how much we care about what is happening. I think we are going to see these families moving to a better place. And whatever we can do to help, that we want to do," George Ralls of Orange County said. For those who own units at the complex, they are concerned that their $50,000 investments will go down the drain if problems at the complex aren't resolved quickly. "This apartment is my income. I use this to pay my bills," one owner said. In 2011, a receiver took over the complex and is in charge of fixing it, but condo owner Lucy Balhy said those who are owners have seen no detailed plan for the money. "He asked me for $2,400 for this special assessment. He's has not explained nothing. He does not have a claim. He has no engineer to see what needs to be done," said Balhy. This month owners received a letter from Frank Barber who wrote that the money would go toward needed repairs. Many owners said they don't have money for a special assessment, and even if they did, they won't just hand it over. Balhy said she wants a breakdown of all the money past and present first. "He has known about his two or three months or longer than that and he (doesn't) make any plans to do any fixes here, he just asks for money," said Balhy. Barber said there are 345 units in the complex that he is trying to collect from. If he is able to get the money from each unit that give him total nearly $830,000. No one could tell Channel 9 if that would be enough money to cover the cost of repairs.